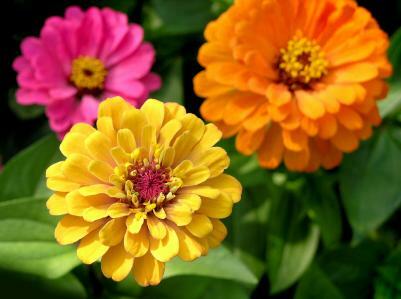 Zinnias add bold, vibrant color to gardens. They come in a range of sizes and shapes, from upright types that make excellent cut flowers to more compact, multi-flowered border plants. Flowers can be large or small, single or double, and come in just about any color but blue. They are the perfect annual to grow for beginners and experts alike. Zinnias are particularly easy to grow. They thrive in full sun, heat, and well-drained soil. If soil is poor, incorporate lots of organic matter such as compost. Space smaller varieties 6 to 8 inches apart, taller ones 12 to 18 inches apart. Regularly deadhead or remove old flowers to keep plants attractive and encourage more blooms. If taller varieties begin to flop, stake them with branches or metal hoops. Zinnias are easy to grow from seed. Sow them directly in the garden as soon as the danger of frost has passed. They grow quickly and may bloom in just six weeks. Choose a spot with rich, well-drained soil; loosen the soil; toss in seed; cover lightly with soil; and keep them watered. It's as easy as that. Powdery mildew is a primary zinnia troublemaker, particularly in humid climates. You can minimize mildew problems by not over watering plants, planting in well-drained soil, and watering plants at soil level to avoid wetting foliage. Also avoid overcrowding plantings which decreases air circulation around them. To avoid problems, grow resistant cultivars such as Blue Point, Pinwheel, Profusion, and many others. You can slow the spread of mildew on susceptible zinnias by spraying a protective coating of a baking soda solution. Mix 1/2 teaspoon baking soda in 2 quarts of water with a few drops of liquid soap. Insect pests are rare, but you may find Japanese beetles, mites, and aphids. If pests are a problem, drop the beetles into soapy water and treat mites and aphids with insecticidal soap. The flowers come in single daisy-like flowers, doubles, cactus-flowered types with quilled rays, and anemone-flowered forms with broad rays around a cushioned center. Flowers range in size from nickel to frisbee size and bloom in lavender, orange, pink, purple, red, rose, salmon, white, yellow, and even green. Here are just a few of the spectacular zinnias to try. Zowie Hybrid is a new plant with intensely colored, long lasting flowers. Blooms are 3-5 inches wide with prominent center cones surrounded by bright rose, rich scarlet and yellow petals. They are weather-resistant and attract butterflies. Plants are 2-3' tall. *Envy has dramatic green flowers. Three-inch blooms look great in the garden or in a vase. Try them with white, deep blue, or pink flowers. Cut and Come Again is a favorite double-flowered zinnia. The more you cut them, the more they bloom. Plants grow 2 to 3 feet tall. Profusion Series plants have extraordinary disease resistance. These plants are virtually care-free-you don't even have to dead-head them. Flowers are 2 to 3 inches across, and the plants spread up to 2 feet across and 12-18 inches tall. The Profusion series includes cherry, orange, white, and yellow. Thumbelina is a compact, dome-shaped plant that starts to bloom when only 3 inches tall. These small 6-inch plants are excellent for pots, low beds and edging. Cut flowers can last a week or more. Harvest the flowers when they are fresh but fully mature, ideally when pollen begins to form. Take a bucket filled with water out into the garden, submerging the cut stems immediately. Re-cut the stems before using them in arrangements. For longer vase life, be sure to use clean containers. In containers, small- to medium-sized zinnias make bright companions for other annuals such as petunias, variegated euonymus, licorice plant, and angelonia. 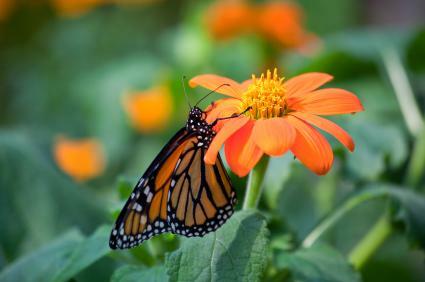 Zinnias can be used to attract butterflies to your garden. Small zinnias such as those in the 'Profusion' series make great edgers for other summer annuals or perennials. Medium-height zinnias blend beautifully into bright bedding schemes, mixing with annuals such as cosmos and dahlias, or contrasting with spiky-flowered annuals such as salvia and larkspur. Tall zinnias are ideal for cutting and can be planted in clusters between perennials in a sunny, mixed bed. Vivid orange-, red-, and yellow-flowered Mexican zinnias are good companions for sunflowers and black-eyed Susans. Brick red 'Bonita Red' looks good with purple coneflowers. Zinnias are often available in mixed colors. Mixes are perfect for creating bright, busy flower gardens or for cutting gardens. Where you need specific colors to fit your planting scheme, look for plant packs or seed packets with only a single color of flowers.